The role of popular music is widely recognized in giving voice to radical political views, the plight of the oppressed, and the desire for social change. Avant-garde music, by contrast, is often thought to prioritize the pursuit of new technical or conceptual territory over issues of human and social concern. Yet throughout the activist 1960s, many avant-garde musicians were convinced that aesthetic experiment and social progressiveness made natural bedfellows. Intensely involved in the era’s social and political upheavals, they often sought to reflect this engagement in their music. Yet how could avant-garde musicians make a meaningful contribution to social change if their music remained the preserve of a tiny, initiated clique? In answer, Sound Commitments, examines the encounter of avant-garde music and “the Sixties” across a range of genres, aesthetic positions and geographical locations. Through music for the concert hall, tape and electronic music, jazz and improvisation, participatory “events,” performance art, and experimental popular music, the essays in this volume explore developments in the United States, France, West Germany, Italy, the Netherlands, the Soviet Union, Japan and parts of the “Third World,” delving into the deep richness of avant-garde musicians’ response to the decade’s defining cultural shifts. 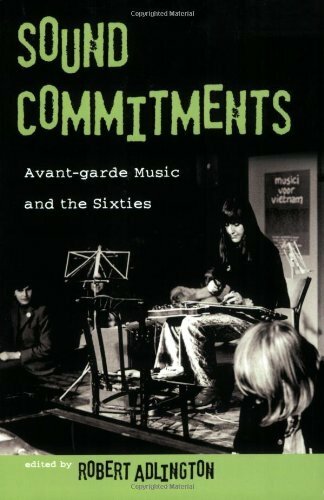 Featuring new archival research and/or interviews with significant figures of the period in each chapter, Sound Commitments will appeal to researchers and advanced students in the fields of post-war music, cultures of the 1960s, and the avant-garde, as well as to an informed general readership. Text: Adlington Robert. cm 15,5×23; pp. 304; 26 ill; paperback. Publisher: Oxford University Press, Oxford, 2009.